As with all of the categories we have reviewed at No1 Reviews, there’s certainly a lot of choice in the Affiliate Tracking Software category – and it’s not always easy to make a decision, even with the wealth of information our reviews provide. This buying guide gives you a heads up on the sort of features and tools you should be looking for within each of the products in this category, along with an appraisal of their relative importance. This should provide you with enough general information, along with the specific detail included in our expert reviews, to make an informed choice. Affiliate Marketing is a type of performance-based marketing that gives online partners (known as ‘affiliates’) the chance to earn money by referring online users to companies and encouraging product sales. 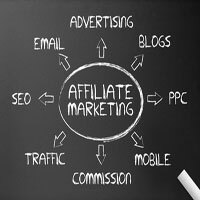 The ways in which affiliates do this varies considerably from site to site, but the most common way of generating an income from affiliate marketing is by using affiliate referral links that can be tracked back to the affiliate once a purchase is made. Affiliate Marketing is performance-based as payment is dependent on the number of referrals made. The precise type of payment structure differs too (see our Glossary of terms in this category for more information on payment structures), but generally payment is made based on the number of clicks an advert receives or on the final number of sales that can be attributed to an affiliate’s efforts. What does Affiliate Tracking Software do? Affiliate Tracking Software pretty much does what it says on the tin, that is, it provides affiliates and program managers with all the tools they need to manage affiliate systems, track links back to particular affiliates and generate information and reporting about the activities of particular affiliates. Affiliate Tracking Software draws together all the features that you would need to run and manage a successful affiliate program and ensure complete accuracy and reliability for all parties. This is essential as affiliates will only market your products successfully (and indeed, work on your program at all) if they feel confident that their efforts will be repaid afterwards. What Important Features Should be Considered? As with all our product reviews, we have considered which features in Affiliate Tracking Software are most important and provided you with a succinct rundown of what to look out for. This means that even if you’re not familiar with the products in this category, you should be able to use our expert reviews to appraise them and better understand what they do. If you’re stuck on any of the more complex industry jargon, check out our Affiliate Tracking Glossary for information on commonly used terms. Of course, the most important features on Affiliate Tracking Software packages are the tracking features themselves. Look out for products that allow for tiered or multi-functional tracking (that allows tracking through a variety of means including cookie and cookie-less tracking) as these improve reliability. Also look out for services that have a good track record of ‘uptime’ as this is the main measure of reliability in this category – you don’t want to pay for an expensive software solution, only to find that it fails you all too regularly! Another key feature for all Affiliate Tracking Software packages is ‘analytics’. This is a term used to describe a wide variety of statistical, reporting and information tools that help provide affiliates and program managers with analysis of affiliate performance. The best packages will contain tools that allow individual affiliates to view and appraise their own statistics, as well as giving managers the opportunity to consider both program wide and individual data to evaluate performance. Many services offer custom reporting tools too, letting users decide on the information they consider most important. As many affiliates will never actually meet with their merchant partners in person, having efficient and effective communication tools in place to aid communication online is essential. Many of the programs we have reviewed in this category contain custom communications tools that help program managers and their affiliates keep in touch, including email lists, messaging and forums and message boards. While this may sound simple, it’s amazing how much easier the process of managing an affiliate program is when these tools are in place. One of the common difficulties with affiliate marketing software in general is that software solutions are tailored to businesses and programs of specific sizes and with a certain amount of traffic. This makes it difficult when the product or market expands in popularity and thus, attracts more affiliates (and more customers). Look out for software solutions in this category that advertise scalability – meaning the solutions offered can be simply and easily adapted to changes in business size. You’ll thank us later! Although definitely not the most exciting element of any product or service, these features are as essential here as they are on any other product. The phrase ‘time is money’ has never been more true than in affiliate marketing, as the industry is fast-paced and even small breaks in service can result in losses for all parties involved. Look out for products that provide wide-ranging, easily accessible customer and technical support for both affiliates and managers to avoid unnecessary problems. As with most products, the decision as to which one to go for is largely down to considerations of value for money. Although some products are more recognisable brand names than others, these aren’t always the best choice – particularly if you have a small budget, so it definitely pays to shop around. Most users will want the best possible product for the smallest financial outlay, so it’s definitely worth checking out our reviews of products in this category in order to find out everything you need to know about a product before you pay for it.